Sledge flags were the idea of Captain Horatio Austin. He was in charge an expedition, mounted by the Royal Navy in 1850, to look for signs of Sir John Franklin's expedition of 1845. There had been no news of Franklin, who set out to find a North West Passage between the Atlantic and Pacific Oceans, since the summer of 1847. The search was in the general area of Prince of Wales Island and Lancaster Sound, and included some journeys over the ice using sledges hauled by seamen. "To retain esprit de corps, and a naval atmosphere, each sledge was given a name, motto and flag." "It was a grand sight to see the whole fifteen sledges, loaded and manned, marching in two long lines over the ice morning after morning, with the frowning cliffs of Griffith Island as a background. There was Captain Ommanney's Maltese Cross on a red field, the blue cross of McClintock, the St George's Cross of Bradford, Osborn's white cross on blue, the arm with a pierced heart of Mecham, the sawn tree of Hamilton, and many more." The flags were two feet by three feet (60cms x 90cms). Details of these flags are derived mainly from an article "Sledge Flags" by H. Gresham Carr in the Mariner's Mirror January 1941, and "Royal Navy" (volumes 6 and 7) by William Laird Clowes. "Much information concerning the construction and equipment of sledges is to be found in the Journals of certain polar explorers. Indeed, they contain the smallest details, but, in almost every case, little or no mention is made of sledge flags. This will come as no surprise to the student of flags, for he is well aware that this particular branch of the science of heraldry has been sadly neglected by all but a few." H.Gresham Carr, who wrote the article 'Sledge Flags', and was editor of Warne's 'Flags of the World' from 1953 to 1961. The flag design of Mecham's flag as shown here differs slightly from what it most probably was. It comes from the Mecham crest and features a hand-held dagger tranfixing a human heart, emitting blood, rather than the arrow. The scan shows the Mecham Arms with crest; from which Lt. Mecham designed his flag. Note the drops of blood from heart. I expect the colour to be similar. The arms awarded to his father, Capt.George Mecham 3rd Dragoons, in 1812 (George Mecham of Garrycastle, co.Westmeath, Ireland). Lt Mecham became a Commander after these expeditions, but died in Honolulu, in command of HMS Vixen, in 1858, aged only 30 years. This is based on a description, "and the sawn tree of Hamilton", using the drawing in Parker's Heraldry with the coronet and motto removed. See also: scan of reference pages from 1857 book of expedition, written by Resolute's Master. Only one flag from the 1852-53 five-sledge expedition which was commanded by Captain Henry Kellet. Francis McClintock again, with a sledge named 'Star of the North'. McClintock's sledge was named 'The Lady Franklin', and the flag included the Franklin motto: Nisu. Flag of Albert Hastings Markham. Expedition to the North Pole, commanded by Captain George Nares. One sledge reached 83 degrees 20 minutes, the nearest to the North Pole then achieved. After this most sledge flags tended to be of a similar style; the personal flag of a sledge commander, rather than the flag of the sledge, or its crew. Early examples had rounded ends, but later the ones were pointed. Pennant of the Royal Geographical Society which was presented to the expedition ship Discovery in Dundee. The badge in the image is black, with some detailing, omitted as the correct colour is not known. Click here for a photo of this flag (sent by Mark Rogacki, 12 June 2005). From Scott's 1901 expedition, and presumably Shackleton's own expeditions. "Red stripe charged with three buckles lozengy, tongues upwards, palewise. On red canton a yellow cross humettee" Flag of Ernest Henry Shackleton, who was Scott's Third Lieutenant. Shackleton led his own Antarctic Expeditions in 1908 and 1914. Wilson's sledging flag is shown at http://www.antarctic-circle.org/E16.htm: [Antarctic explorer] "Wilson's flag hangs in Gloucester Cathedral (�). I thought it was at his Cambridge college, Gonville & Caius, but going there last October and seeing the flag in the dining hall, it was clear that this was the college flag which Wilson took south with him (�) and not his sledging flag. It's mounted on the wall beside the high table, protected by a covering." See the flag in all its beauty here (tiny shield on a blue field): http://www.flickr.com/photos/9494577@N04/2068815457/ for which we have to thank mffitzgerald (photo uploaded 27 Nov 2007). Caption: "From the dining hall at Caius and Gonville". Ernest Shackleton�s Antarctic Expeditionary party of 1907-1909 also visited the house, and the book contains the signatures of all the crew and some illustrations by the artist, G. E. Marston, one of the official artists of the expedition. There is also what may possibly be an unpublished poem by Shackleton, entitled Mount Erebus, from which Clive reads a passage: �Keeper of the southern gateway / Rugged and grim and grand / Warden of the wastes uncharted / as the years sweet on you stand.� (Note: Clive later found that the poem Erebus does appear in a published expedition book, but it is signed as �Nemo�, hence it was not previously publicly known that Shackleton was the author of this piece). A colored picture of a waving flag on a small hill was drawn on the pages of the Ernest Shackleton�s Antarctic Expedition (1907-1909). The flag had � if I noticed correctly � five horizontal bars, blue and white. Is this an expedition flag for this event only? How should I interpret this flag? It might have been just an expedition flag. On display at the Otago Museum, Dunedin, New Zealand, is a major exhibition on Antarctic exploration and research (January 2007). Dunedin's port, Port Chalmers, was the last stop for Scott before his fateful final trip to the "Big Ice". Among the items on display is a sledge pennant designed for Birdie Bowers on this final expedition. For reasons explained further down, it was never used, but it is an interesting piece of flag history nonetheless. Here is the description from the accompanying panel displayed next to the pennant. "In 1939, Lady Maxwell, sister of "Birdie" Bowers, donated to Waitaki Boys' High School (Oamaru, NZ)'s Hall of Memories the pennant she had embroidered for her brother's sledge. Individual sledge pennants had been made for Scott's first Antarctic expedition, and the custom continued on the 1910-12 expedition. Lieutenant Henry Robertson "Birdie" Bowers was originally in charge of stores on the 'Terra Nova'. His abilities, however, impressed Scott so much that by the time the vessel had reached Melbourne he was included in the shore party, and Bowers delightedly wrote home saying he would now need a sledging flag, including specifications and a sketch. It did not reach the Antarctic, however, until the 'Terra Nova' returned there in January 1912. By then the polar party of Scott, Bowers, Wilson, Oates, and Evans had already left on their ill-fated journey to the South Pole. "The pennant carries the red cross of St George, on a white ground, common to all the sledge pennants, and also, on a blue ground, the Bowers family crest - a leg pierced by an arrow, encircled by a belt, with the motto 'Esse Quam Videri' ("To be rather than to seem")." Can you tell me what flags would have have flown from the mast while the ship was trapped in the ice? There are numerous photos taken at the time online (a Google image search of endurance+ice+shackleton turns up quite a few). Something is definitely flown from the mast in some of the pictures (see http://cache.eb.com/eb/image?id=42110&rendTypeId=4 and http://www.solarnavigator.net/history/explorers_history/hms_endurance_ernest_shackleton_antarctic.jpg and it would make sense if it was the Union Jack. Images of the ship just before it went down don't seem to show any flag there, though, so presumably it was lowered. (See http://www.tepapa.govt.nz/NR/rdonlyres/67A44329-AB26-4035-8E5A-B26FCA4B7192/0/endurance_350.jpg. Page 90. The ship the ship is crushed and partially sunk in the ice, and a what appears to be a Red ensign is flying from the gaff peak. It's a monochrome photo and the flag is not fully extended, but that's what it appears to be (and it's what one would expect on a British merchant ship). 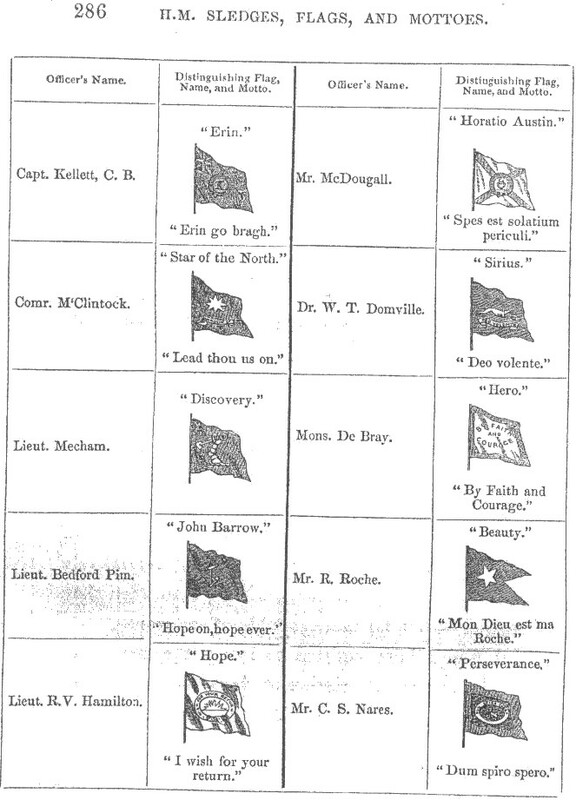 Page 105, showing the temporary base at Ocean Camp after the ship was abandoned, shows a union flag flying on an improvised flagpole, above what the caption refers to as the "ship's burgee." The design, if any, on the burgee is not visible, but it appears to be larger than the union flag. Page 70, a shows the crew eating dinner aboard the ship before she was abandoned. A New Zealand ensign is hanging from the overhead in the background. The ship's proper ensign would have been the British Red Ensign, which would under normal circumstances have flown from the ensign staff at the stern. It is most unlikely that the Union jack would have been flown from the mast head as this was reserved for the Royal Navy to indicate that there was an Admiral of the Fleet on board. No such restriction would have applied to the position of the expedition flag. Flag of James Wordie, geologist on Shackleton's 1914-16 expedition. Congrats for the very good likeness of the James Wordie Sledging flag. I have just had it restored and you will be pleased to hear it is not going to be sold (the Antiques Roadshow had a ludicrously high value). Is there any information about the use of sledge flags after 'The Heroic Era' and contemporary use on SnoCats, skidoos and other motorized vehicles (which, by the by, still include towing slightly modernized Nansen Sledges very similar to the 1900 model). Lots of safety oriented internationall orange location pennants and small national flags have been and are used on vehicles of all sorts but as to the more personal flags? For example - Fuchs and Hillary flew some sort of personal or expedition flags from their machines in 1956 when the went across Antarctica (I know of the 1911 flag Fuchs also re-flew at the pole). New Zealand field teams may still design and fly 'sledge' flags when they travel on the ice (and as 'memento's'). I cannot get confirmation or find references to anything except for 1850-1924. To answer Mark Rogacki's query about whether explorers still use Sledge Flags. I know for a fact that several recent expeditions internationally have had Sledge Flags. Those in the Polar Regions tend to have them but only if they are (a) British and (b) of a traditional frame of mind. This issue is complex because of the need to carry the banners of one's sponsors. Individual explorers do have personal banners. I used the OZ Red Ensign as such and I carried the SA flag because I am a member of the Royal Geographical Soc. of South Australia. I felt I should carry a symbol of one of the mobs I belong to. The Expedition to Lambert Centre (The Geographical Heart of Aust.) some years ago circa 2010 carried the SA flag. What the QLD part of the Expedition (it was a joint RGSQ-RGSSA expedition) carried I don't know. But that is a start to answering this query and I shall be keeping my eyes open. I am still trying to come up with a suitable design myself. It is complicated by the fact of Nationality. Do I put what flag in the heading or chief of the Sledge Pennant? As an Aussie the ANF is offensive to me. The St. George flag suggests Englishness but my antecedents are Scottish/Irish and Gypsy in that order. So something like James Wedge's(?) flag. Or do I, for the sake of economy go for a rectangular banner? What Aussie symbols should I use and the matter has been further complicated by the fact that I have recently discovered my mother's family's connections to James Cook. My father's tribe were also involved in exploration.